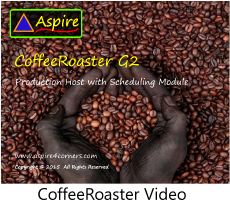 The CoffeeRoaster Management Module is an optional extension of the CoffeeRoaster application. The Management Module connects to the data file across the network and provides direct access to current CoffeeRoaster data, but more importantly provides a series of Forms and Reports dedicated to providing greater insight into CoffeeRoaster data. The CoffeeRoaster Management Module provides additional summary information and graphing of Coffees by Roasts providing monthly totals (lbs) by Roast/Blend. In addition, the management module allows management to monitor events in CoffeeRoaster during the day and to configure new Coffees or other CoffeeRoaster data. The Roaster Module also allows calculation of the dollar amount represented by the shelf inventory. 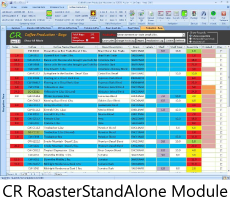 The CoffeeRoaster Management Module provides considerable additional data analysis and access to confidential data totals and information. Individual Coffee Statistics and Graphs are provided by the CoffeeRoaster Production Module, the Management Module adds similar statistical analysis and graphing for Final Roasts. Final Roasts are the finshed product that goes into packaging, generally a Roast will be associated with multiple individual Coffee Items of different size or packaging options. 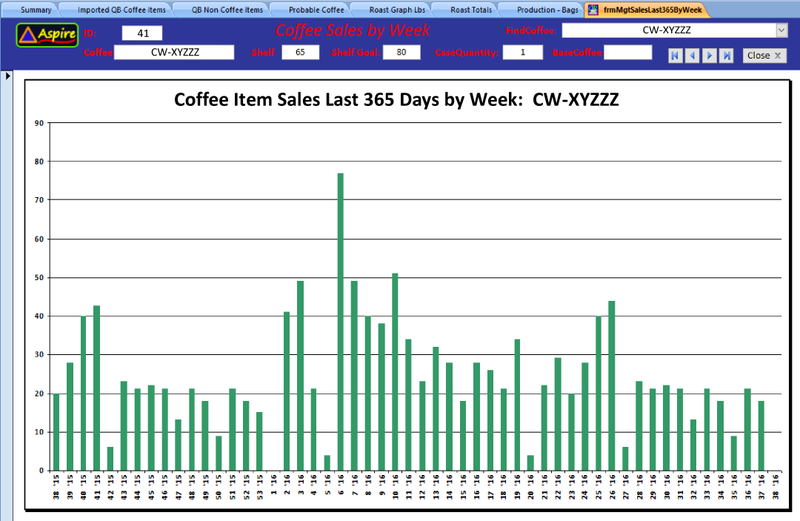 In the image above, detailed Sales information is provided for a Coffee Item covering the last 365 days and summarized by Week. The purpose of this is to show sales history trends but also to provide a means for setting Shelf Goals. Shelf Goals represent how many of a specific coffee item that you want to have on hand for anticipated orders. The Ribbon (top section of the form) provides summary information for confidential information such as the estimated dollar value of the Green Coffee Inventory and the dollar value of the Shelf Coffees. 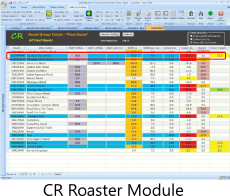 The CoffeeRoaster Management Module provides many data analysis tools not included in other Coffee Roaster Modules including Pivot Tables and Quarterly Crosstab Queries. 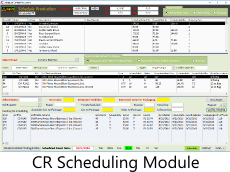 The initial interface for the Management Module includes several of the Production Host forms, but does not feature the Import QuickBooks capability hosted only by the CoffeeRoaster Production Host Module. A Management Module specific data group for the Ribbon displays Coffee Sales Year to Date, Coffee Production Year to Date and monthly and weekly data for the same categories. 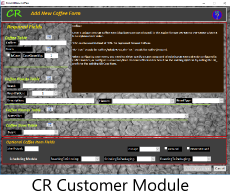 The CoffeeRoaster Production Module provides the ability for the CoffeeRoaster Administrator to configure Shelf Goals for individual coffees. 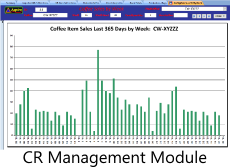 The Management Module adds to this capability considerably by providing a graph for each Coffee Item showing the daily or weekly sales history for the previous 365 days by week. This makes it much easier to understand the Sales activity of individual coffees so that Shelf Goals can be set appropriately.